Some of the best “derelict aircraft” discoveries are serendipitous. This post’s subject is such a case. It was during a research trip in Turkey in late May of 2011. My former student and then colleague Mark Nicovich and I had been dogged by a nasty Anatolian spring thunderstorm all day. The storm caught us on the unprotected plateau of “Midas City” and, apparently making up for an earlier near miss, hit us with an unmerciful downpour and then pelted us with hail for about 20 minutes. The glories of the site (a future post, no doubt) made the assault quite worth it, even though the Canon SLR I borrowed from my daughter Rachel, was killed by the soaking. We returned to our rental Skoda and headed along a parallel path with the storm, intent on beating it to Gordion, the ancient Phrygian capital, some distance away. After a brief stop at Amorium, we were driving rather speedily northward when I spied two planes off to the right, near a major interchange: an old biplane of some kind and an unmistakable F-4E Phantom jet. Despite the race with the storm, the unidentified biplane dictated a stop. We took the ramp of the interchange, pulled over on the side of the highway, got out, and crossed the access road by foot to what now was obviously a monument display. Thankfully, I had my small backup Sony camera in my pocket. The plane of interest (nothing against the F-4E, but they are common) proved to be a Breguet 14, a World War I French bomber/scout plane mounted on concrete pedestals! A century-old largely wood and fabric airframe would never be appropriate to mount on an all-weather permanent display, so I was not surprised (but a little sad) to find that the Breguet 14 was a replica (but a well-done one, and thus deemed fit for this series). The Breguet 14 was a French designed and built World War I workhorse, operating as a two-seat scout plane and bomber. Its incorporation of comparatively large amounts of metal in the airframe was innovative and made it one of the most durable planes of the war. Consequently, it continued in production after the war and was used in a number of airforces into the 1930s. That included Turkey. Which brings us to this particular memorialized plane. A little extra research revealed that the donation was raised by Sivrihisar residents after their occupation and then liberation in the Battle of Sakarya, one of the pivotal campaigns of the Turkish War of Independence. During that battle, a Greek Air Force Breguet was captured by forced landing, put into service by Turkey, and named Sakarya Uçağı (see here for that info in Turkish). I surmise that the utility of that plane was the inspiration for the purchase of the Sivrihisar Uçağı, and it provided the precedent for naming the latter. So the storm of conflict brought out Turkish resolve. Speaking of Turkish resolve . . . immediately after our visit to the monument and pulling back on the highway, we were flagged down by a waiting Turkish policeman. Unlike many before him on our journey, he spoke excellent English and explained that we were speeding. As we had not even gotten up to speed when he pulled me over, I protested briefly. He calmly explained that he had detected our speed from the other side of the other highway before we had exited. He thought we had tried to avoid apprehension by doing so and was waiting for us, but I explained that we saw the biplane and turned to investigate. He understood and we had a nice talk about the history of the airplane. Then he issued my summons and gave friendly instructions on how to pay. We parted as friends, Mark and I admiring his Turkish sense of duty and patriotism, and the officer appreciative of our interest in his history. With the conflict between Turkey and POTUS in the news this week, I felt prompted to feature an unusual and unappreciated site in the former, long on my list of potential “You Don’t Get This on the Bus Tour” and/or “Pic of the Day” posts. Adada (lat/long = 37.572972, 30.984000): the city has an unusual but melodic name, probably Pisidian in origin (modern uses of the term, however applicable to my thoughts below, may not be fit for a family-oriented post). The name first appears in the now lost writings of the geographer Artimidorus of Ephesus (2nd century BC), quoted by the later geographer Strabo (Strabo 12. 570). The site of Adada in the mountainous region Pisidia of Asia Minor (modern Turkey) is an underappreciated delight where encountering other human beings is a rarity. There is a nicely paved agora/Roman forum and adjacent Acropolis reached by well-preserved steps. Looking NNE from the acropolis, the remains of several buildings preserved to roof height can be discerned between the scattered oak trees a few hundred meters away. The closest building is the Bouleuterion (city council house), but I am more fascinated with the three between it and the small theater. They are ruins of temples dedicated to the Roman Emperor Trajan, the Roman Emperors (presumably collectively), and the Emperors in conjunction with Zeus-Serapis. Of the former, there is not much left aside from a single wall. The Temple of Zeus Megistros Serapis and the Emperors is better preserved, but with the roof and entrance scattered about on the surrounding ground. The Temple of the Emperors is the most photogenic, with entrance door frame standing, two walls fully intact, and the part of the rear cornice in place. Aside from the aesthetic quality of Adada’s remains (I love good ruins in deserted locations! ), the site evokes thoughts on the nature of Roman Emperor worship. Why did the ancients occasionally deify their rulers and, in the case of Rome, build temples to them? Was it genuine conviction that the rulers were gods, or was it mere political expediency? Or (as I rather suspect) was it a fair dose of the latter, carried forward by the human nature to adore heroes, align ourselves to alpha-leaders, and idolize celebrities (of all kinds) who make perceived contributions to our lives while ignoring their foibles (especially after their death)? Emperor Worship was a tool of the Imperial Roman government since (before?) its inception. Asia Minor (modern Turkey) led the way in institutionalizing this practice—no doubt initially for political ends. Perhaps to encourage local acceptance of the practice, or maybe as a natural religious evolution—both possibilities are disturbing—in many places Emperors were identified with popular local cults; particularly as Zeus who was equated with pre-Roman (and even pre-Hellenistic) local deities. Adada’s temples provide us with a spectrum of this phenomena. It may not be too far-fetched to suggest that the same dynamics of politics, religion, and human nature can be seen in our own times. It might be worth noting that refusing to give the Emperor the honors due him, in the eyes of Rome or its local agents, was tantamount to rebellion (as for the Jews of Jerusalem in AD 66) or disloyalty (as for early Christians that refused to worship him). Perhaps the lesson is this: there is a potential cost for attempting to rise above humanity’s baser instincts. “Santa is dead; I have been to all three of his tombs!” That tongue-in-cheek potential presentation title is the idea of beloved former student, now-former colleague, and fine scholar, J Mark Nicovich. The conundrum of three tombs (plus many other claimed relics) arises from the traditions that St. Nicholas, bishop of Myra in Asia Minor (now Demre in Turkey), was buried in that city but his remains were stolen on two different occasions and taken (ahem, . . . “translated”) to Bari in southern Italy in 1087 and Venice, in northern Italy in 1101. Thus, there are Churches of St. Nicholas in all three locations, each claiming to enshrine the resting place for the inspiration and namesake of Santa Claus. See Part 1 of this Trilogy on “St. Nick’s Not-So-Final Resting Place?” here (and Part 2 here). So, which church/city possesses the real relics of St. Nicholas? As it happens, recent months have seen some significant developments in this question. The claim that Nicholas’ body has remained in Myra/Demre is significant; and the note that tourism would be boosted if it is found is telling. Are city status and tourist revenues a motivation? Bari and Venice surely took note . . .
On 6 December (significantly, the date of St. Nicholas’ death and Feast Day), articles announced that relics of St. Nicholas subjected to Carbon 14 analysis by the Oxford Relics Cluster at Keble College’s Advanced Studies Centre dated to the fourth century; i.e., consistent with the AD 343 death of the historical bishop. Careful sifting of the published info reveals that the single bone tested is owned by an American priest in Morton Grove Illinois, who says he obtained the relic from Lyon in France.3 By inference, the Oxford University news release suggests that the bones in Bari and Venice therefore could date to the fourth century as well. There is no solid connection between the American relic and those in the Italian churches. But the Bari relics of St. Nicholas are missing part of the pelvis, of which the tested bone apparently comes. During restorations at Bari’s Basilica di San Nicola in the early 1950s, the tomb of St. Nicholas was opened for the first time since it was sealed by Pope Urban II in 1089. The bones were examined by Luigi Martino, Professor of Anatomy at the University of Bari, who found the skeleton was incomplete. A complete skull, however, allowed reconstruction of the ancient face—that of Nicholas, if the bones are authentic.4 In 1992, Martino was asked to examine the relics in Venice. The latter were all broken into smaller pieces, but he concluded that the Venice fragments were complementary to the bones in Bari and they are from the skeleton of the same man. A narrative that the Bari sailors in 1087 hurriedly absconded with the skeleton and left pieces behind to be found in 1099 by the Venetian raiders is thus possible.5 So, in a spirit of ecumenical peace, the Bari and Venice claims can coexist and they can share the reconstructed image of the Saint adored in both places. The logical—but unlikely—next step is to use DNA analysis to connect the bones of Bari and Venice, and either radiocarbon date them or include the Illinois fragment in the DNA analysis. This, however, would spoil the remaining mystery. 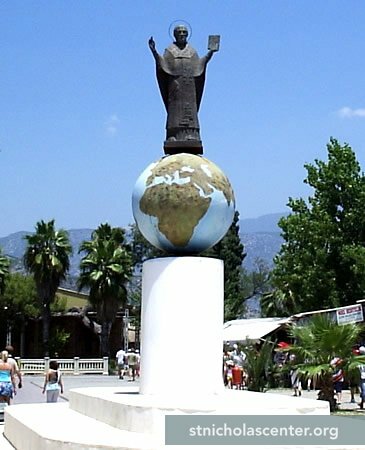 In 2000, a Russian sculptor and the mayor of Moscow presented Demre with a bronze statue of St. Nicholas in Orthodox style, which was placed atop a large globe on a pedestal in the town square, a block or so in front of the church. It is a fiberglass “Turkish Santa” with a heroic stance and victorious mien, holding a small child on his shoulder and another by the hand, each raising a wrapped gift. Controversy aside; I like it. Actually, I like them all. The changing images (and names) of St. Nicholas are a commentary on social roles of hero figures, cultural appropriation, tribalism . . . and really on human nature. 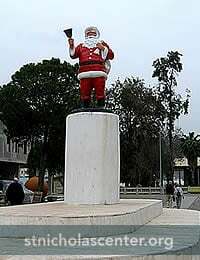 Most Americans of recent generations experienced an evolution (or revolution) in their own concepts of Santa Claus while maturing, not so unlike the changes of statues in Demre. And as for the question of the travels (or not) of Nicholas’ bones; I am taken back to the catalyst for this series of posts: the NORAD tracking of Santa on Christmas Eve, mentioned in Part 1. While the notion that government technology could track his sleigh is exciting, and the website is visually impressive (and educational), I cant help feeling that it robs something from that childhood wonder at the mysterious how and unknown when of Santa’s anticipated arrival. Then I realized the technology and presentation didn’t really answer anything—there is always more mystery and wonder. So, that is why I rather suspect (and perhaps secretly hope) that the true fate of Nicholas’ remains will remain similarly unknown. Life is just more interesting that way. 1 Salim Uzun, “Body of St Nicholas buried in Demre, claim officials,” Hürriyet Daily News, 4 October 2017. 2 ibid; from what I can determine, all other news items giving this information cite/depend on this original English article. 3 “Could Ancient Bones Suggest Santa was Real?” http://www.ox.ac.uk/news/2017-12-05-could-ancient-bones-suggest-santa-was-real, 5 December 2017. Note also the unwarranted sensationalism of the news release title; and from Oxford! Really? 4 See the concise and excellent overview at “Anatomical Examination of the Bari Relics,” St. Nicholas Center, http://www.stnicholascenter.org/pages/anatomical-examination/; including reconstructions of the face! 5 “Is St. Nicholas in Venice, too?,” St. Nicholas Center, http://www.stnicholascenter.org/pages/relics-in-the-lido-of-venice/. 6 Again, the best summary of this is found at the St. Nicholas Center site: “Four Faces of Nicholas—Who is He in His Hometown?,” St. Nicholas Center, http://www.stnicholascenter.org/pages/demre-statues/. 7 Karl Vick, “Turkish Town Exchanges St. Nick for Santa: Local Hero’s Statue Moved From Square,” Washington Post, 24 March 2005, p. A01. This is a brief intermediate follow-up to “Part 1 of St. Nick’s Not-So-Final-Resting-Place,” before we get to the conclusion in Part 3 (that will make it a trilogy!). Here I will focus on the city where St. Nicholas (Santa Claus) was bishop and what can be seen there. Ancient Myra was a typical Greco-Roman city of some regional importance. About 5 km away lie the ruins of Myra’s Mediterranean harbor town, Andriake. An ancient synagogue, identified by a menorah decoration and inscription, is of special interest. The site of Andriake, recently opened to the public, also includes fine harbor buildings, restored monuments, a huge cistern, and ancient boat replicas. Given his reputation among sailors, Nicholas no doubt was familiar with Andriake. Myra is located in Lycia, where the most visually unique ancient remains are tombs, with several types carved in the ubiquitous rock cliffs of the region. Not far from the Church of Nicholas, a nice array of such tombs can be seen above the ancient theater of the city. Meanwhile, back at the Church of St. Nicholas, we have not answered the questions posed in Part 1.1 We will address these and the question of Nicholas’ appearance in Part 3 (perhaps later today?) . . .
1 I.e. : Who has the real St. Nicholas? Bari or Venice? Or, could his remains remain in Myra (Demre)? As I write this, it is Christmas Eve, and NORAD (North American Aerospace Defense Command) is already performing its annual national defense duty: (that of tracking Santa on his rounds). It occurred to me that we can attempt to track Santa’s movements in antiquity—or at least those of his remains . . . .
As is well known (and which will not be detailed here), Santa Claus is a derivative from Saint Nicholas, a quite real early Christian bishop from the city of Myra in southern Asia Minor (now the city Demre, Turkey). After a ministry that spanned the Peace of the Church, defending children, caring for the people in Myra during famine, protecting sailors, saving the falsely accused, and a purported action role at the Council of Nicea in 325, Nicholas died on December 6 (now his feast day), AD 343.1 He was buried in Myra where a church was built over his tomb after his remains were said to produce a healing liquid called manna. The church itself is difficult to appreciate as it is somewhat lower than the present ground level of that part of Demre, and the entrance is covered with scaffolding as part of a long-ongoing excavation and restoration project. So, why is the sarcophagus clearly broken? And why is the title of this blog post: “St. Nick’s Not-So-Final Resting Place?” And what does this have to do with tracking Santa’s (remains) movements? So, who has the real St. Nicholas? Bari or Venice? Or, could his remains remain in Myra? Tune in tomorrow for Part 2 . . .
1 For interesting and informative info on Nicholas, his history, and transformation into Santa Claus, see the St. Nicholas Center. 2 The most accessible sources are found at the St. Nicholas Center. This post and Pic of the Day is inspired by an article that I shared on Facebook earlier today. The article claims (and I am not going to argue with the premise) that a large personal library with an increasing number of unread books is a good thing. This made me feel better, as I am in the midst of organizing and integrating the ungodly quantity of books from my former office—too long in storage—into my home office (and the rest of the house by necessity). * Meanwhile that process had made me somewhat melancholy over the fading use of repositories of physical books in our increasingly digital society. With sadness I noted that I have even had difficulty giving away books to younger folks who assume that all knowledge is a click away. With that thought, and keeping with the theme of my blog, I offer a couple of pics of lost libraries from the past. Of course, the supreme example of a lost storehouse of knowledge is the great ancient library of Alexandria, Egypt.1 Sadly, its exact location is lost, and more sadly, I have not been to Alexandria. 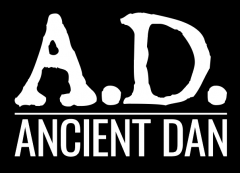 So, and more appropriately, I present some lesser-known and more-forgotten ancient libraries. 1 See Roy MacLeod, ed., The Library of Alexandria: Centre of Learning in the Ancient World (London: Taurus, 2004); and Luciano Canfora, The Vanished Library: A Wonder of the Ancient World (Berkely: Univ of California Press, 1989). 2 On this edifice, see Lionel Casson, Libraries in the Ancient World (New Haven: Yale, 2001), 114-18. 3 Casson, 49-52; Canfora, 45-50.